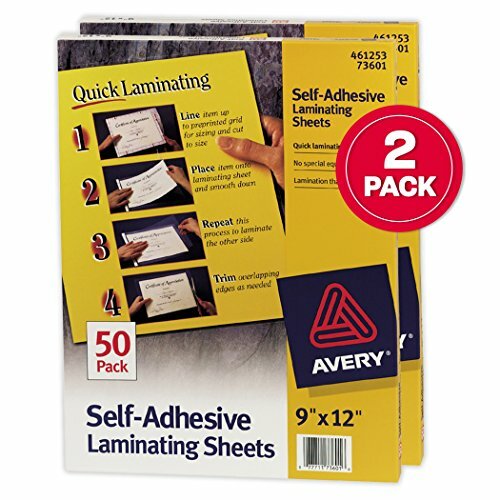 For quick laminating needs, these easy-to-use Avery self-adhesive laminating sheets are the ideal tool. Each sheet is coated with self-adhesive for convenient, inexpensive lamination, no lamination machine needed. Simply use the included grid to size the document, place the document on the adhesive side of one sheet, lay the second sheet adhesive side down to seal the other side of the document and trim the edges. Soon you'll have a beautifully laminated document that looks professional and will stand the test of time. Special two pack includes a total of 100 laminating sheets.